or Yelp, a preview of the video, photo or photo album will appear in the GMail message itself. This makes easy for us to view the album, watch the video, browse the photos, etc, directly in the email message. How to enable in my GMail account? 2. 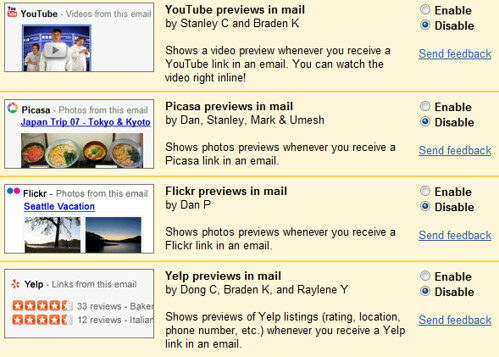 Enable “Picasa previews”, “Flickr previews”, “Youtube previews” and “Yelp previews”. Sometime back, When you minimise the chat gadget (by clicking the minus button in the gadget), you will not be able to search the contacts as simply as we do with the chat box. Minimise the chat gadget (the search box is still available). Google has formatted Orkut Friends birthday details in a calendar format, to be used in Google Calendar. Google Calendar was already available in GMail. 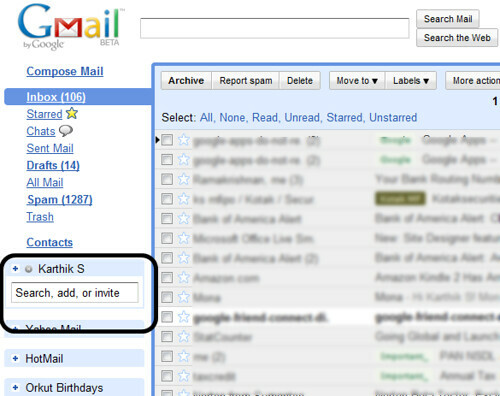 Now by integrating Orkut birthdays in Google calendar, it also gets integrated to GMail. Today, I saw a link in orkut, “view your friends’ birthdays in Google Calendar” . Google Calendar, asks for confirmation to add the calendar “orkut friends’ birthdays”. In one click, I added all my friend’s Birthday’s into my Google Calendar. 1. 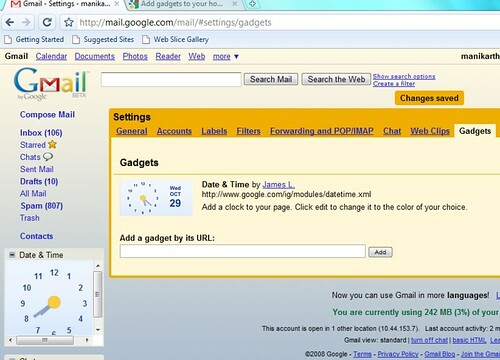 Go to GMail Labs settings. 2. Enable, Google Calendar Gadget. 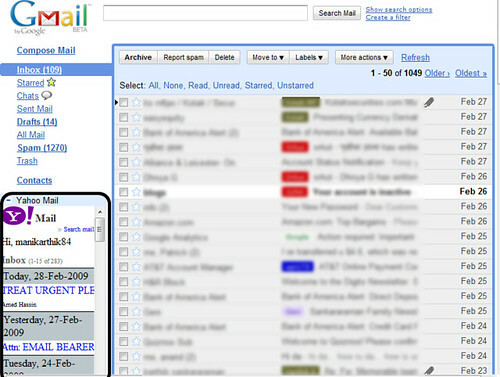 Let us add Yahoo Mail and Hotmail to GMail. 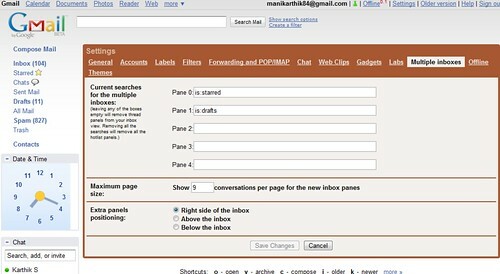 There are ways to get your Yahoo mail, Hotmail in GMail’s inbox by using auto forward in Yahoo Mail / Hotmail settings. 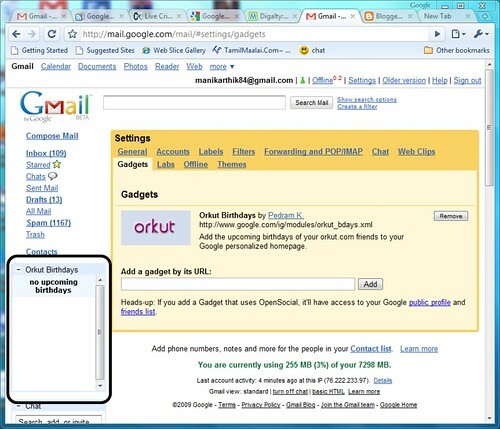 Let us add Orkut Birthdays gadget by Google to GMail. After announcing Google Latitude , Google has added the location identifying feature to GMail also, through one of the GMail Labs feature, “Location in Signature”. All Emails have the standard fields, Sender name, Sender email id, Recipients, Timestamp sent. 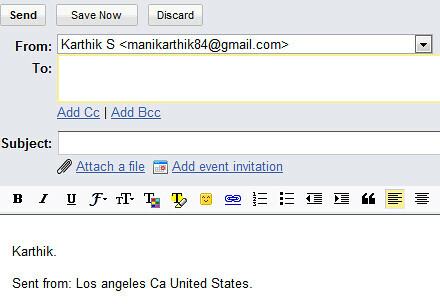 Now Gmail adds one more field “Sender’s Location”. This will be useful for the recipients, to know where from the email is coming. And also to the sender, when he looks at the emails at a later point of time. How to add location to Gmail Singature ? 1. In Gmail Labs Settings, enable “Location in Signature” ; Save Changes. 2. Goto General settings tab and enable signature, and also select the “Append your location to the signature.” check box. Save changes. 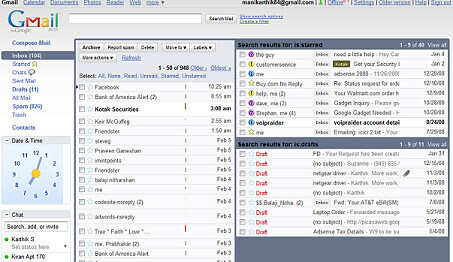 In addition to default inbox, you can add two more labels in the default view. 3. Go to Multiple Inboxes tab in Gmail Settings, select the labels you want in the default view. 4. Give the label names as “label:LabelName” in the Pane 0, 1.. text boxes. If you want a pane, that should display messages from a particular contact, give “from:(emailid@example.com)” in the Pane text box. 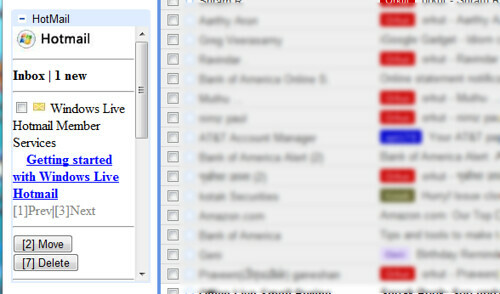 Or if you want to have all the email messages that has the word “Adsense”, just give “Adsense” in the pane box. 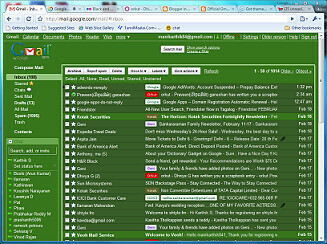 Gmail labels act as folders : Do more with labels! 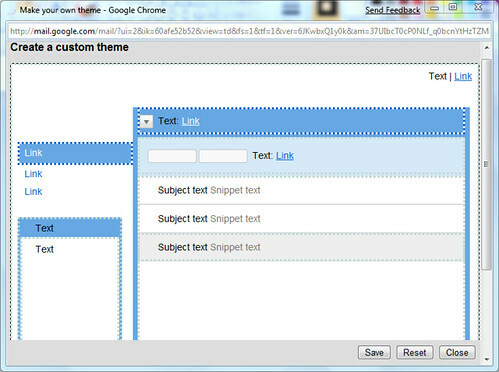 What is the new link in Gmail page, Do more with labels! about? Google has added a button to Gmail, which gives a way to you use Labels as folders. The “Move to” button, drops down and shows all the labels you use. Once you select a label, the message moves from your Inbox to Archive folder, after applying the Label to the message. When you click the particular Label from the navigation bar, you can see all the messages with the label, and this gives a feel like using folders for the emails (Even if the message is archive folder). Gmail still provides the capability to add multiple labels to a message, which is why Google has “Labels” concept instead of Folders. 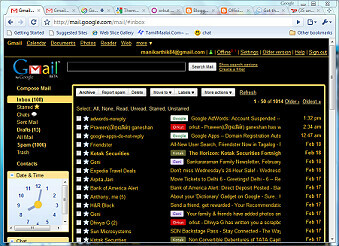 Most of the iGoogle gadgets can be now used in your gmail page, in the side navigation bar.